Vonette Bright could speak directly to women in today's society. She was a mother and grandmother, and was a wife of 55 years to Dr. Bill Bright. 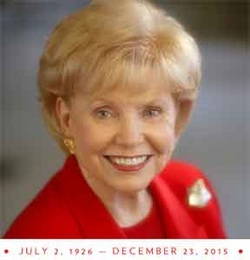 Vonette Bright had the special talents and life experience for ministering to all women. And... that's the uniqueness of Women Today Radio. Women Today was launched in 1993 under the direction of Vonette, co-founder with husband, Dr. Bill Bright, of Campus Crusade for Christ International. With an emphasis on practical spiritual insight, her daily one-minute feature encourages women to live fully for Christ, impacting the world in which they live and serve. Concerned for the moral and spiritual values of our nation and the world, Vonette founded the Great Commission Prayer Crusade in 1972. This later became a ministry of Campus Crusade. Her deep commitment to prayer also led to the formation of the National Prayer Committee, a group of leaders who seek to motivate other Christians to unite in prayer for spiritual awakening. In 1988, as Chair of the National Day of Prayer, Vonette was successful in introducing this to legislation that was unanimously approved by both houses of Congress to make the first Thursday of every May a permanent date for the National Day of Prayer. Among her other work, Mrs. Bright has co-authored (with Nancy Moser) the Sister Circle series with its accompanying studies, and is well-known for The Joy of Hospitality, co-authored with Barbara Ball, which includes a supplementary cookbook. Mrs. Bright also wrote The Woman Within, a practical application of the Holy Spirit. Fueled by his passion to present the love and claims of Jesus Christ to "every living person on earth," Dr. Bill Bright spent more than five decades building and leading Campus Crusade for Christ International, which now has its headquarters in Orlando, Florida. William R. “Bill” Bright, founder of Campus Crusade for Christ, died July 19, 2003 from complications related to pulmonary fibrosis. He was 81. As the world’s largest Christian ministry, Campus Crusade for Christ serves people in almost 200 countries through a staff of 26,000 full-time employees and more than 225,000 trained volunteers working in some 70 niche ministries and projects ranging from military ministry to inner-city ministry.